Ripon Cathedral(or Ripon Minster), standing in the centre of Ripon, 25 miles to the north of Leeds, is lovely. It is the smallest cathedral in England. Small as it is, its history is one of the oldest. Beda described that a little monastery of wooden structure, the origin of the cathedral, was planted in the heathen village of Rhypum in about 655 by Eata, Abbot of Melrose. St Wilfrid, Bishop of York, founded the cathedral, the first stone church in the north of England, in about 669 and the crypt of those days has survived. But Wilfrid's monastery, probably about one third of the present cathedral size was said to be one of the finest buildings in the west of the Alps, was destroyed by fire by the Danes, the Vikings, in about 860. Most of Japanese think of England as the nation of the Anglo-Saxons mainly. It was surprise for me to know the history that over a half of the country was once occupied by the Vikings and a lot of descended people live there and their cultures still remain. 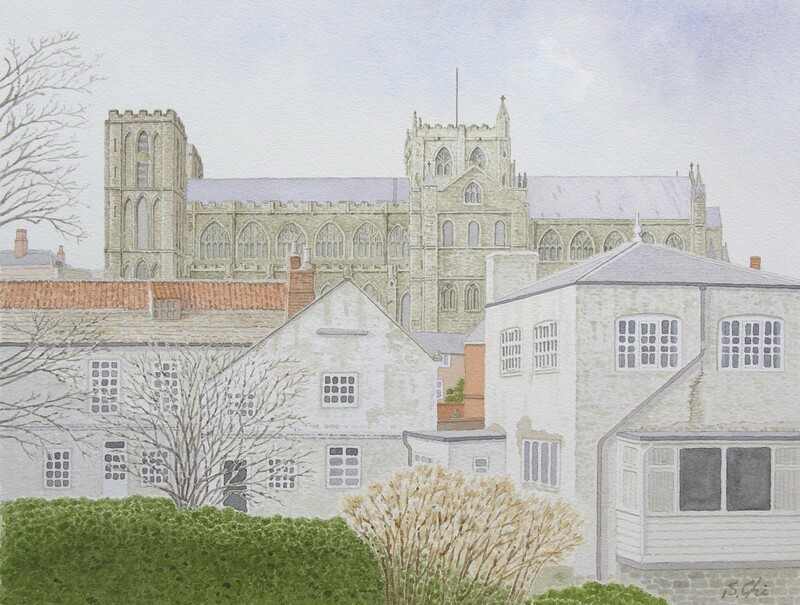 Ripon Cathedral was rebuilt in about 900, but destroyed again by the imfamous Harryng of the North of the Normans in 1069, when they suppressed the rebellions of the Anglo-Saxons against the William the Conqueror. It is said that the Norman troops made raids on all of the Anglo-Saxon's vikllages and hamlets and wasted the north-east of England from the River Humber to the River Tees. The third stone church was rebuilt by Thomas of Bayeux, the first Norman Archbishop of York in 1080. Then the following Archbishops of York, who inherited the possessions and privileges, maintained the cathedral and had it thrive on. The present fourth stone church was built by Archbishop Roger of Pont L'Eveque in 1154 and remodelled by Archbishop Walter de Grey in 1220. Ripon, one of the smallest but loveliest cities in England, is famous for its Hornblower "sets the watch"　at 9 p.m. by blowing the Wakeman's Horn at four corners of the market place and in the front of the Mayer's house. This custom is said to be continued for over a thosand years without a break since the times of Alfred the Great. The story says that Alfred, King of Wessex, considering the importance of Ripon as one of the strongholds for counterattacks against the Danes, when they had occupied over the north half of England, granted Ripon the first charter with a horn of a wild ox as the emblem of the city in 886. This horn is now displayed at the Town Hall. It seems the custom of the hornblowing started in those days. In the Middle Ages, probably in the 15th and 16th century, the Wakeman, a forerunner of the Mayor selected from aldermen, set a watch appointing constables and held himself responsible for the safety of the town through the night. The householders paid a small fee to the Wakeman to escape robbery. If their houses were robbed and something was taken away by the dawn when the horn was blown again, the Wakeman had to compesate the householders for their losses. It is said to be the earliest burglar insurance system in the world. It is the English who invented such a system.